Pesto crusted salmon is our favorite weeknight dinner. It is so easy to make. You can serve it with almost any greens or grains, but my favorite way of eating it is with kale and asparagus salad, and a small piece of crusty bread on the side. I found the recipe for the salmon a few years ago in the Little Dish recipe book and we have been making it ever since. It is also a total hit with our kids. They like their pesto salmon with couscous, and a few fresh vegetables. 1) Pre-heat the oven to 400F. 2) Wash the salmon fillets in cold water and pat dry with a kitchen towel. Take out any big bones using your fingers and place the salmon fillets on a baking tray. 3) Spread the pesto all over the salmon making sure you also cover the sides. 4) Place the breadcrumbs in a large bowl. Take one salmon fillet at a time and place it in the bowl with the skin side up. Press firmly to help the breadcrumbs stick to the salmon. Turn the salmon on its side (left then right) making sure that sides are covered in the breadcrumbs as well. Place the fillet back on a baking tray. 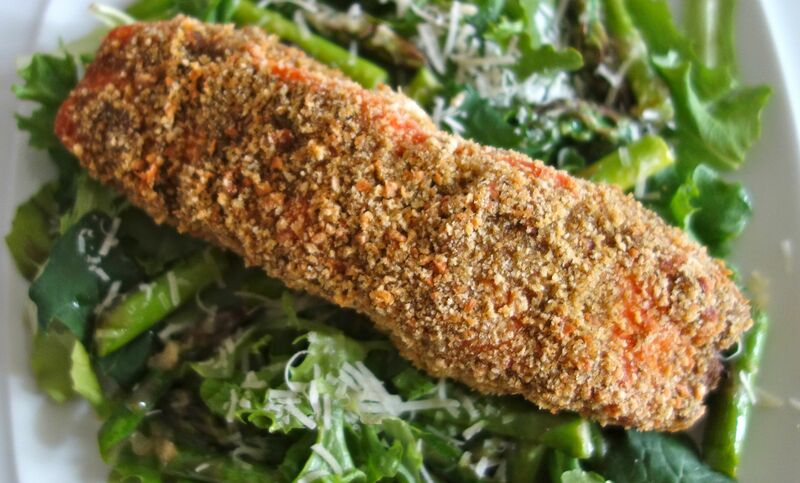 Repeat the process until all of the fillets are coated in breadcrumbs. 5) Place the salmon into the preheated oven and bake for 20-25 minutes. 6) While the salmon is baking, take the asparagus spears and cut them diagonally into 2 inch pieces and set aside. 7) Melt the butter in a 2 quart saucepan and add the asparagus. Cook the asparagus, stirring regularly, until the pieces are tender but still crunchy for about 8 to 10 minutes. 8) Once the asparagus is cooked stir in the grated cheese reserving some for later. Set the asparagus aside to cool. 9) Add the baby kale salad and the cooled asparagus to a bowl and mix well. Divide the baby kale and asparagus salad between plates and sprinkle with the remaining cheese. 10) Add the baked salmon and enjoy.